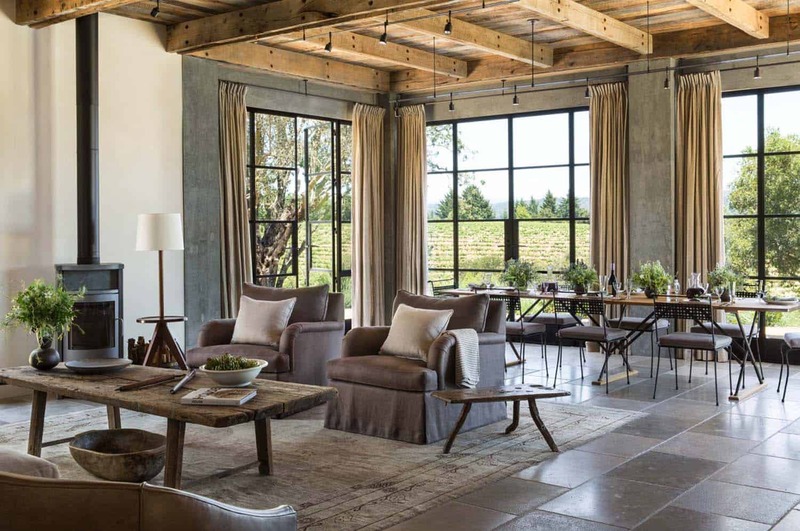 This beautiful wine country farmhouse was designed by Arc Design and Jute Interior Design, located in Healdsburg, Sonoma County, California. 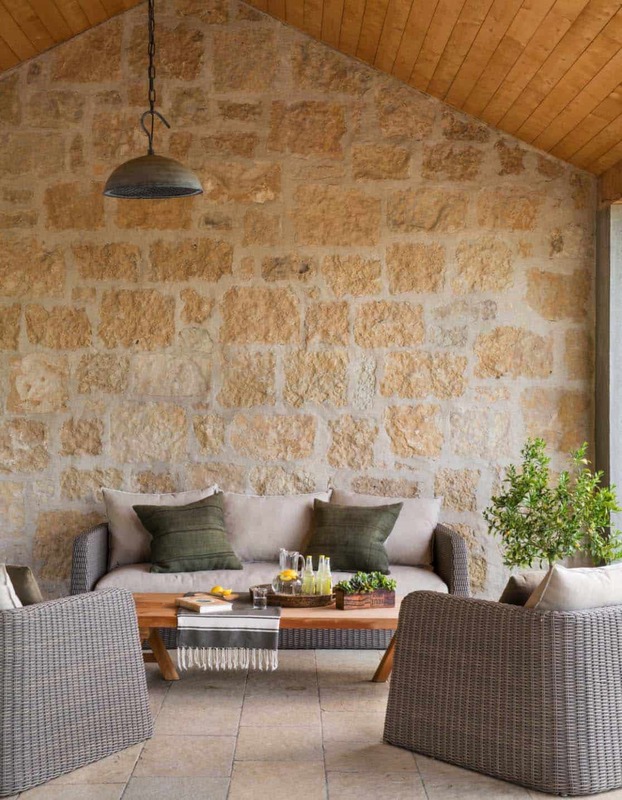 The stone clad vacation retreat is full of rustic yet refined luxury interiors with a muted palette and comfortable furnishings. 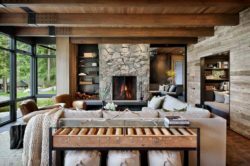 With a wonderful mix of textures and textiles, the open plan interiors is delineated by cozy area rugs and perfect furniture arrangements. 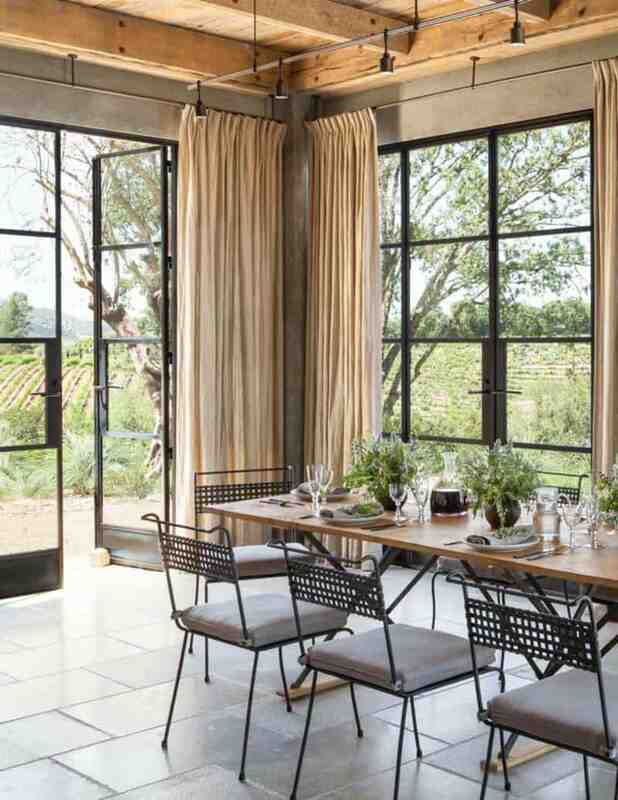 There are large expanses of metal factory windows to soak in the gorgeous views of rolling hills and vineyards. 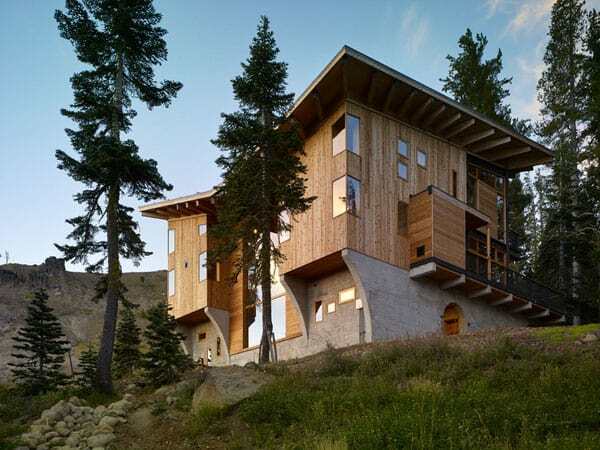 With high ceilings clad with wood, the home exudes warmth and comfort. 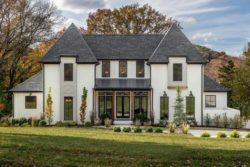 Blurring the boundaries between indoors and out, this is the perfect home for entertaining family and friends Spacious outdoor living areas and a tantalizing swimming pool invite you to spend plenty of time outdoors. 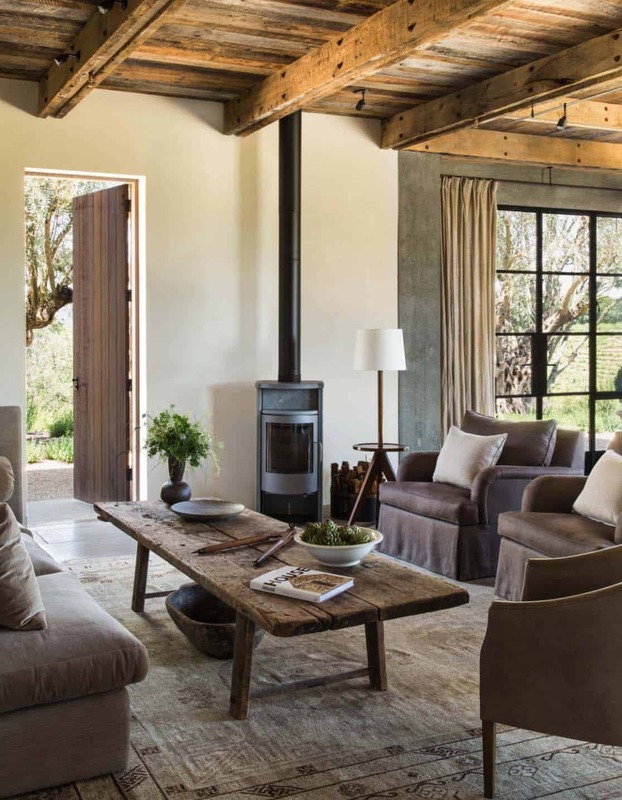 This cozy living space offers a warm wood stove for cool evenings. The wood coffee table infuses warmth into the space. Comfy furnishings and pillows invites guests to sit and share great conversation. 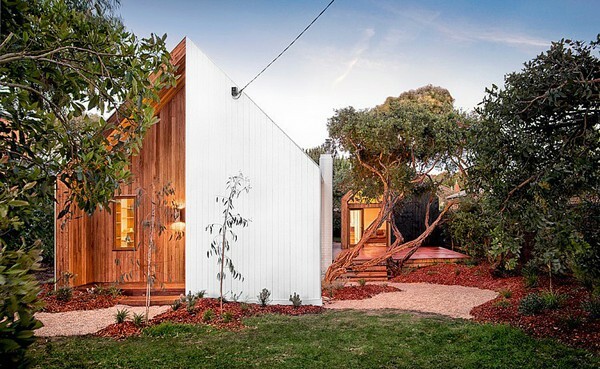 A wood door allows access to the meticulous outdoor landscaping. Above: The coffee table is an antique dining table that was cut down. The area rug is from Tony Kitz in San Francisco. 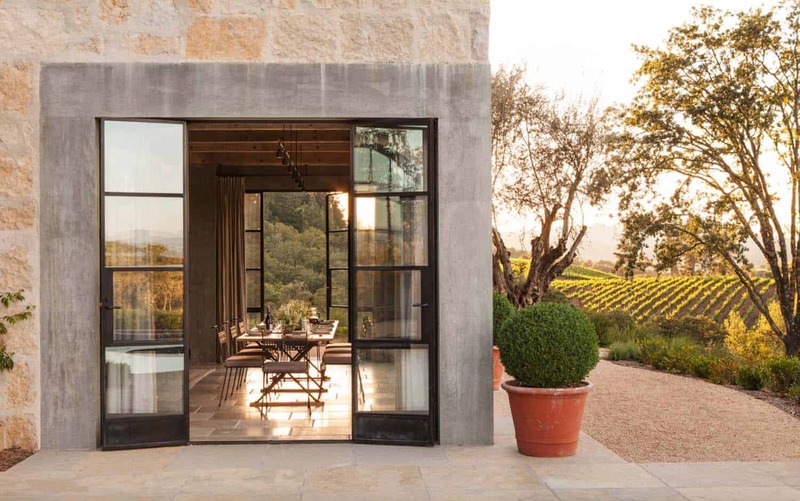 What We Love: This wine country farmhouse is absolutely magnificent, so many exquisite details both inside and out. 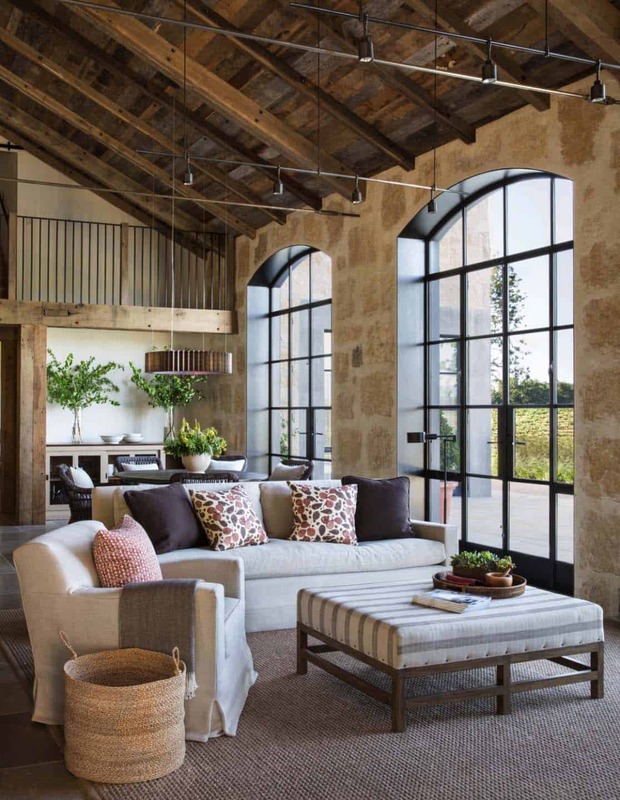 Loving the large indoor space, the comfortable seating areas and the restrained yet attractive decor. 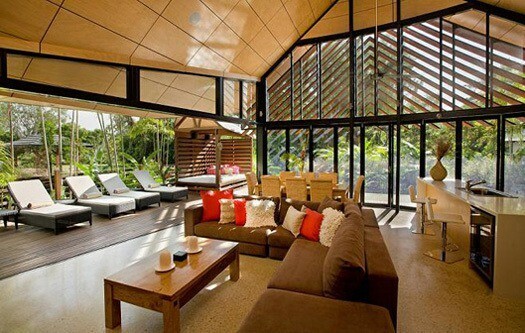 Expansive windows frame the amazing views and bring the outdoors inside. 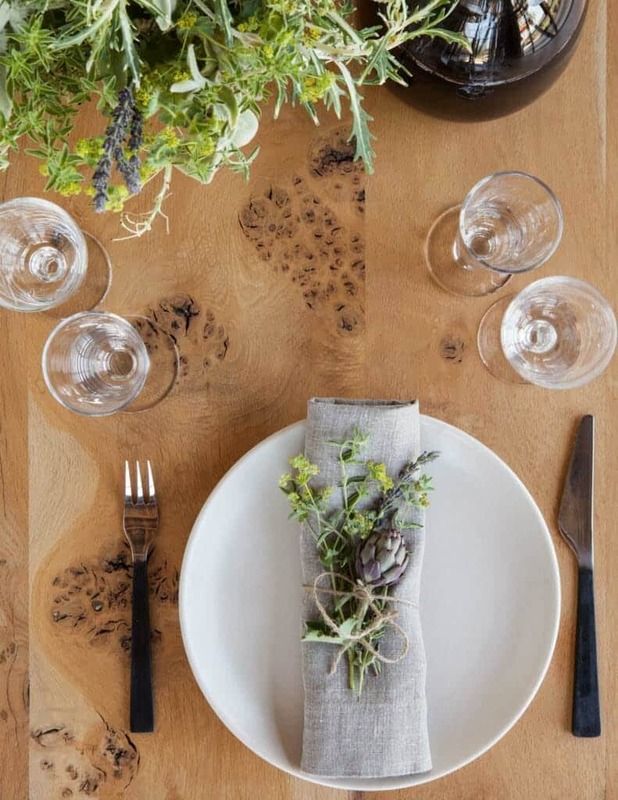 Some of our favorite details includes the hand troweled walls, the english burl wood table and the stone walls against the timber wood ceilings. 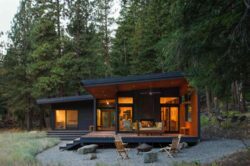 Readers, have a look through the rest of the images and let us know what you think of this picture perfect getaway in the Comments! Above: The window treatments are JAB hardware and de la cuona linen on the draperies. 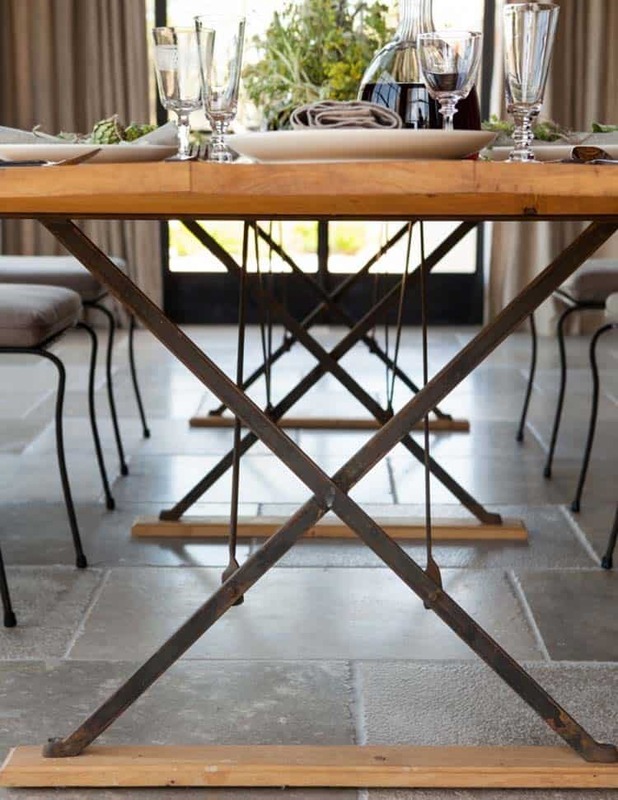 The dining table is from Rose Uniacke in London. 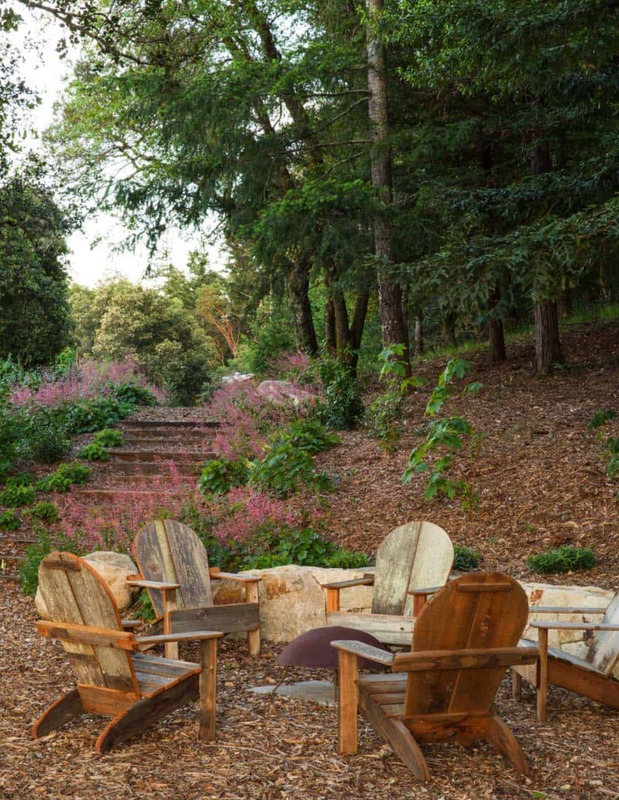 The chairs are custom for the space, while the seat cushions are upholstered in a washable Romo textile. The suspension lights above the table are from LBL Lighting. 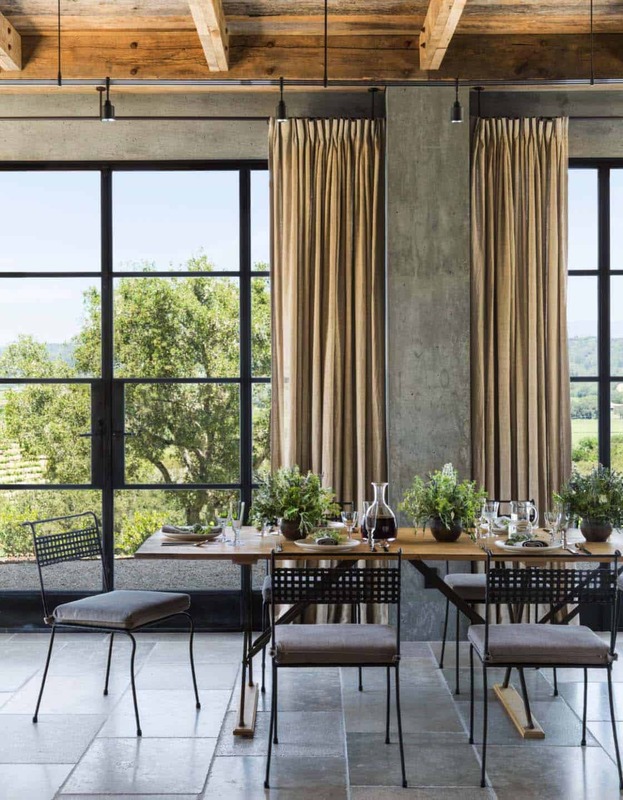 Off the dining room are large French doors that open on three sides, making the interiors feel like spacious covered porch. 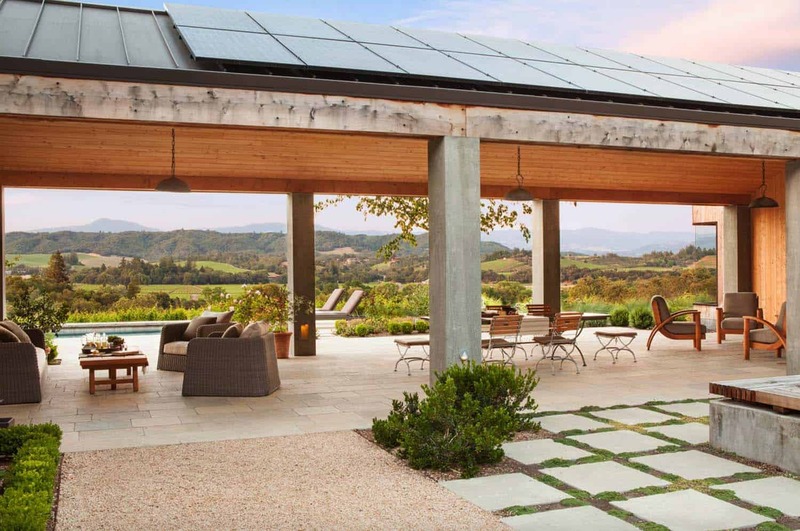 It also allows fresh air to circulate throughout the inside of the home on a warm, sunny day. 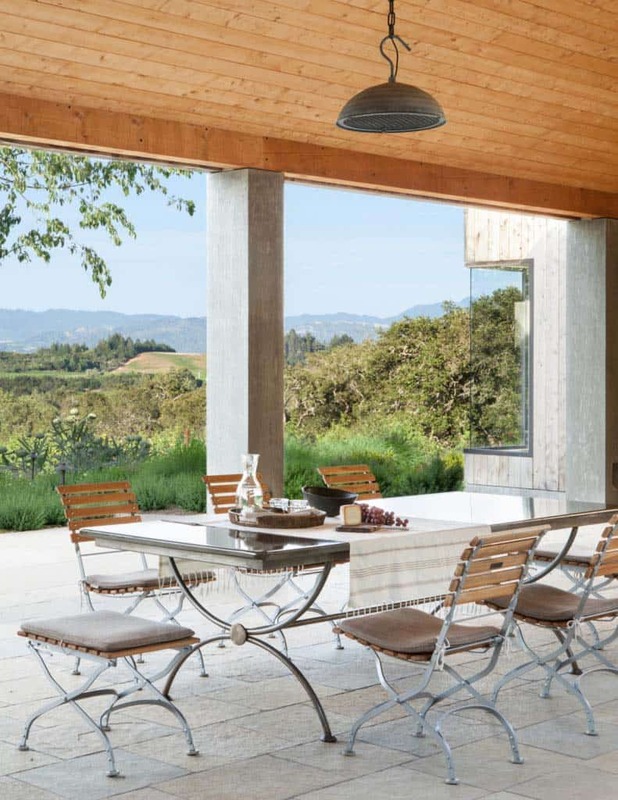 Above: The flooring is Limestone from Exquisite Surfaces. 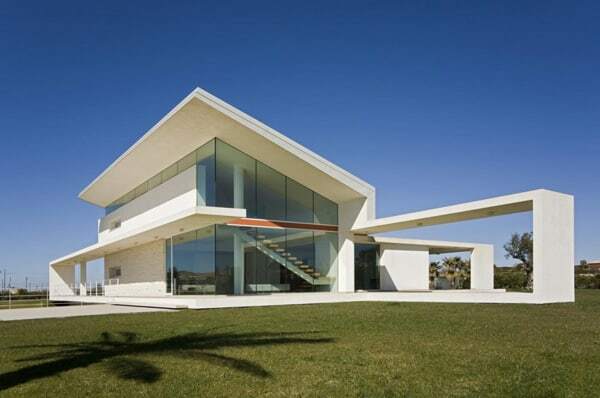 The walls are a custom mixed plaster. 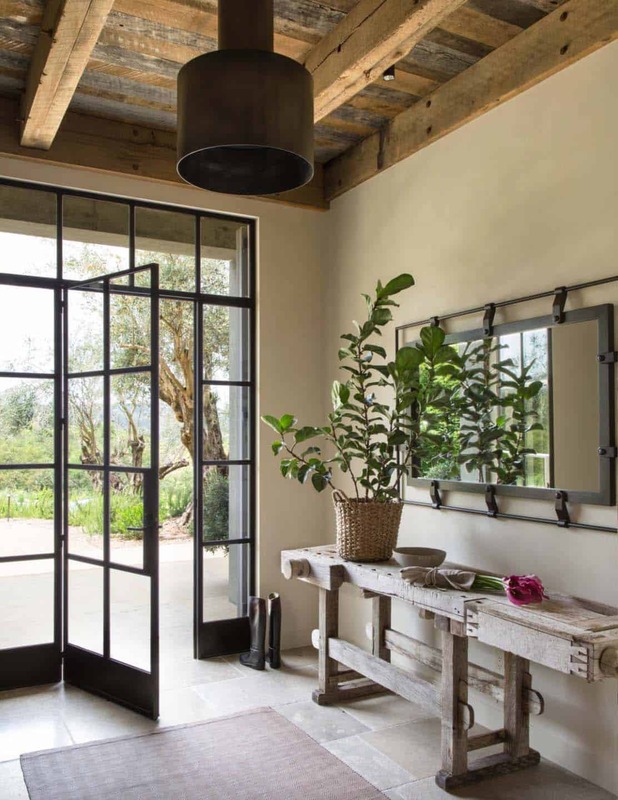 On the wall above the entry table is a custom mirror made of oak and stained in an ebony finish. 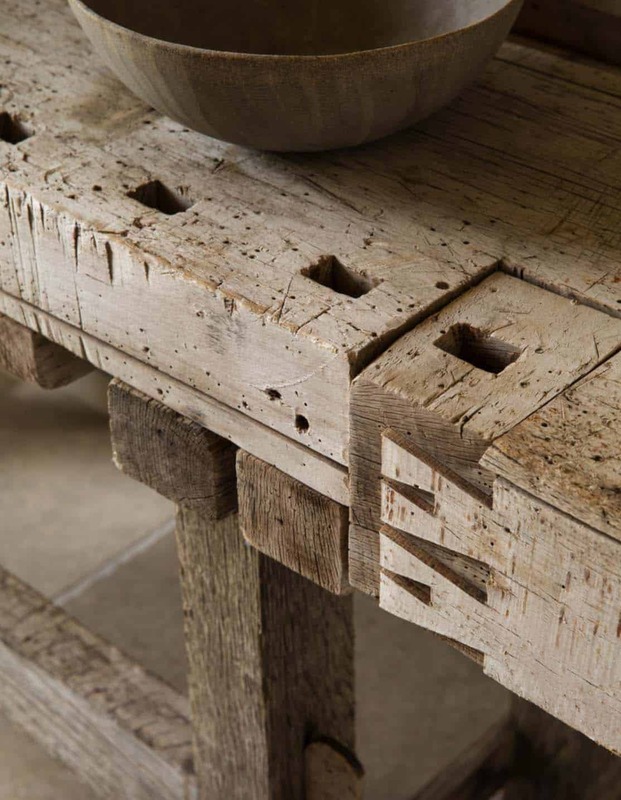 The table is an antique workbench. Try 1st Dibs for similar. The light fixture was custom design for the space and fabricated by Urban Electric Co. Designed as an open concept with the kitchen, the family room is where the owners spend most of their time. 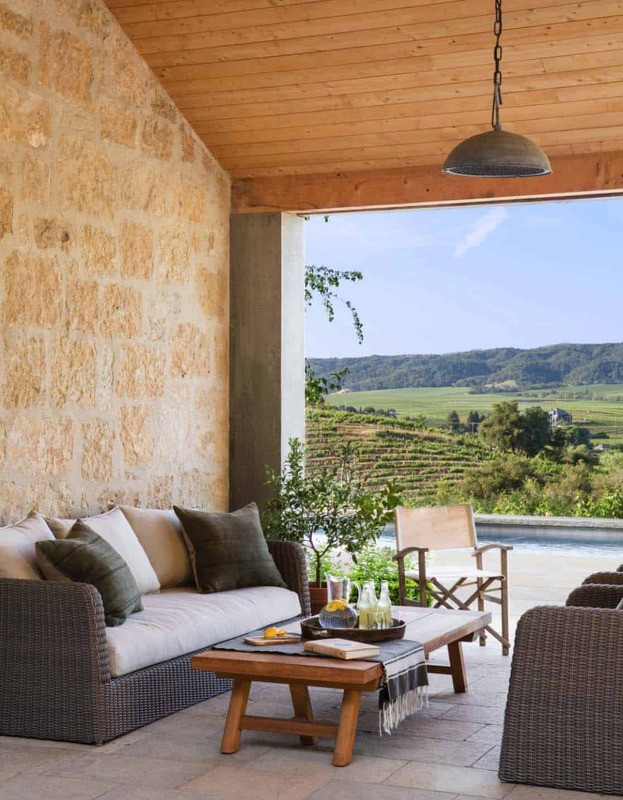 This space also offers convenient access through arched french doors to the exterior living spaces and the swimming pool. Above: The Gear Chandelier is from McEwen Lighting Studio. 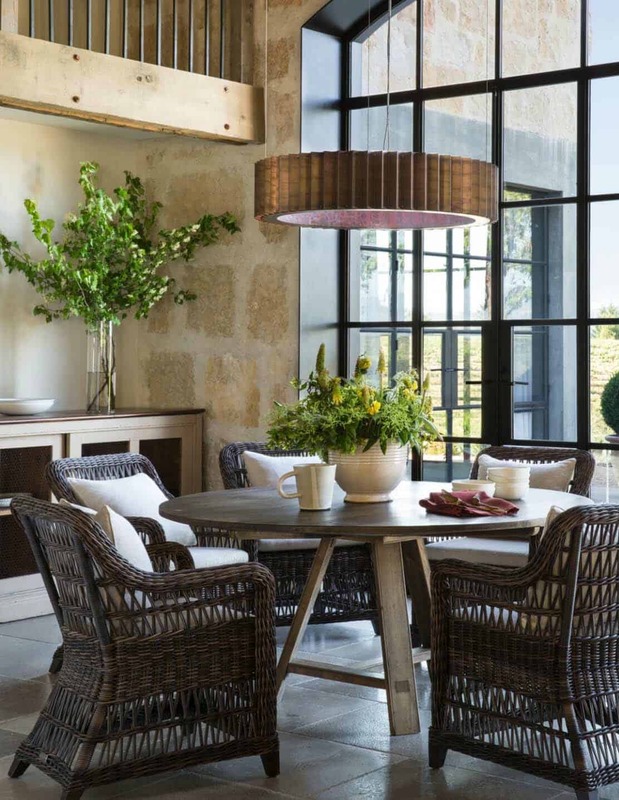 The dining chairs are from Janus et Cie. 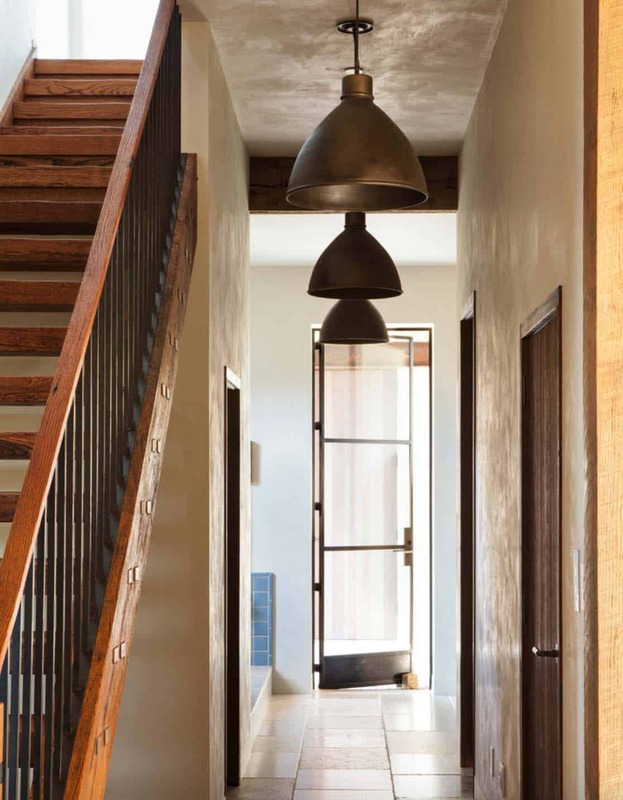 This main hallway in the house is used often by the homeowners, who use the entry door from outside into the mudroom which also houses a doggie shower on the left. 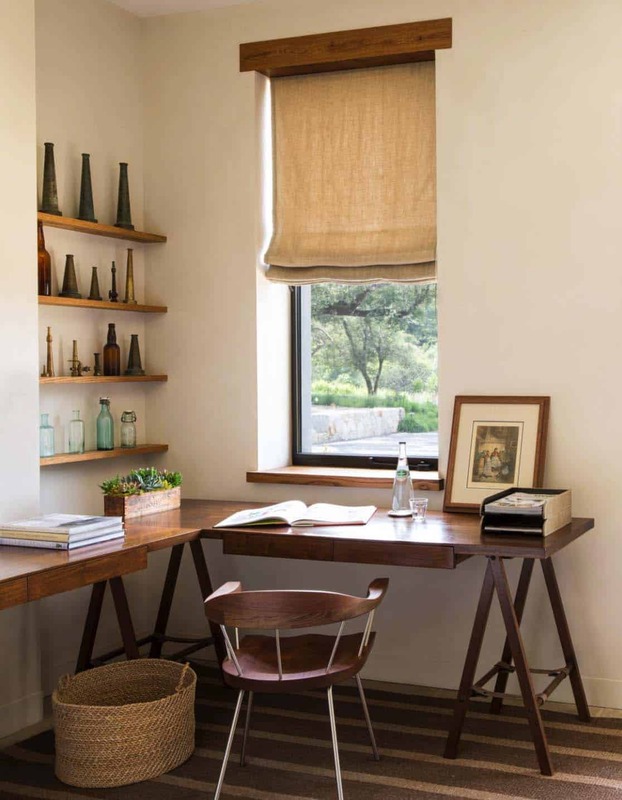 Above: The bedside lamps were designed by Erin Martin Design in Saint Helena. The bed was custom designed, the headboard is upholstered in a Holland and Sherry textile. Similar bed linens can be found at Rough Linen. 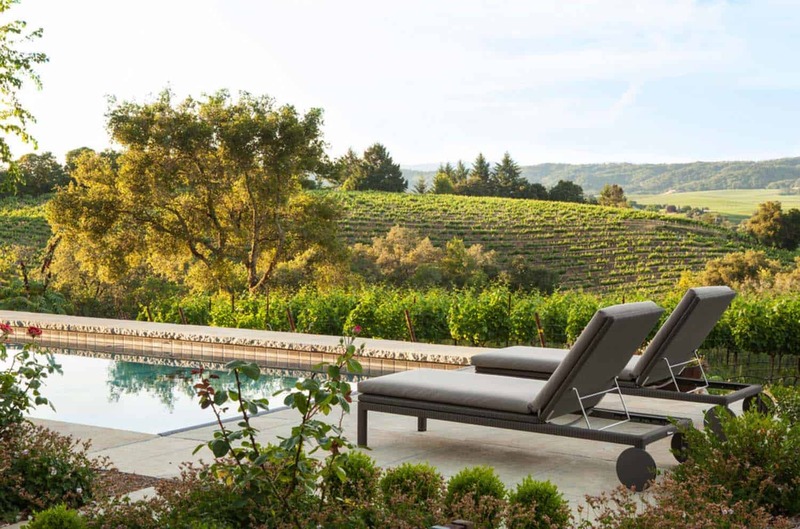 The bench at the end of the bed is an antique purchased from Maisonry in Yountville. 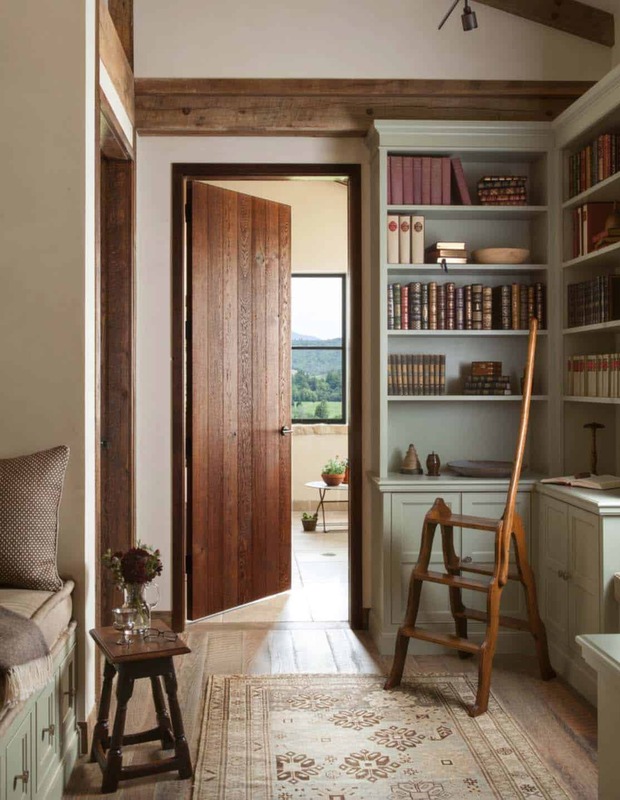 This cozy library space with a built-in nook is situated conveniently just off the master bedroom retreat. 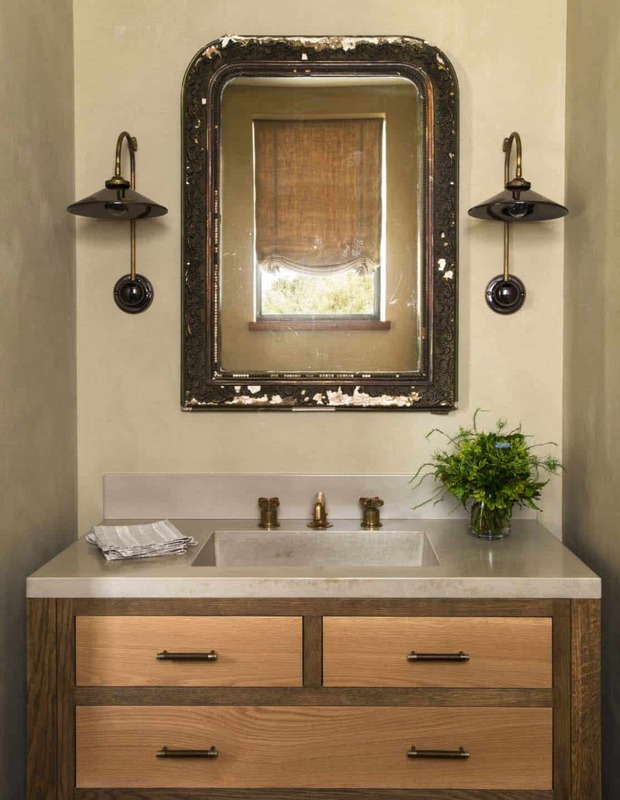 Above: The powder bathroom vanity is custom with leather pulls from holland and sherry and a concrete top. The faucet is from Waterworks. The wall sconces were sourced from a UK lighting company, Hector Finch. 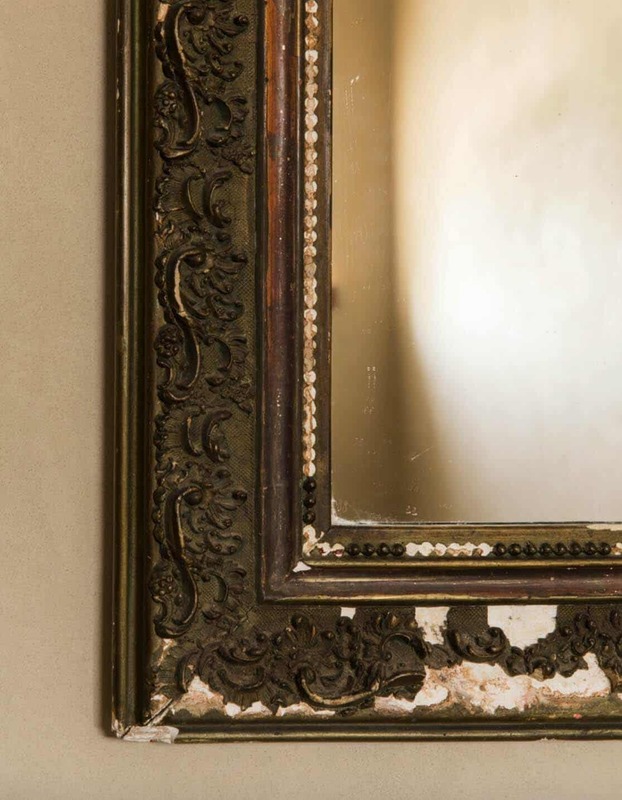 The mirror is vintage from Galerie Half in Los Angeles. 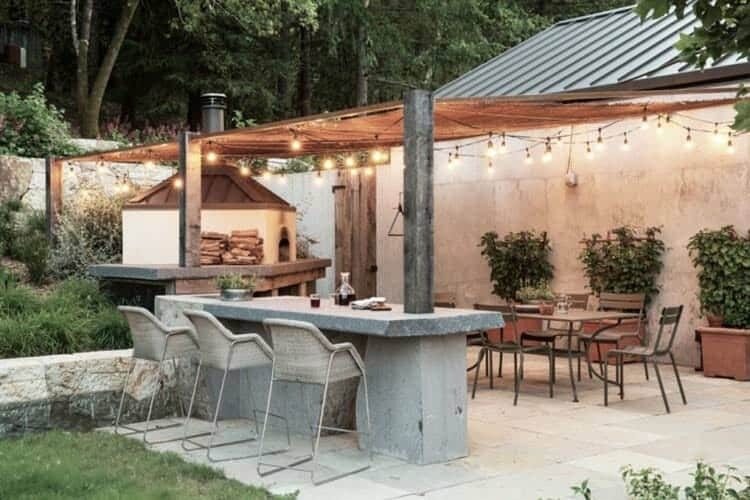 The outdoor kitchen offers plenty of seating for entertaining, a wood burning oven, perfect for cooking pizza! String lights illuminate the covered space, casting a magical glow. 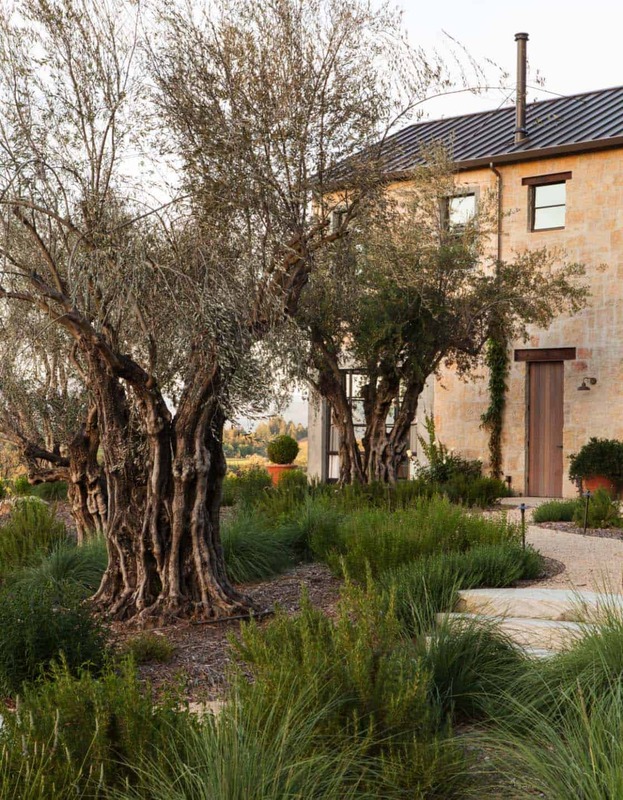 The beautiful topography was designed by landscape architects Lucas & Lucas, who planted these stunning ancient olive trees, on the property.